Lit City Blues: This Week In Vexillology #218: Canada Day Special! This Week In Vexillology #218: Canada Day Special! Adopted on February 24th, 1965, the flag of New Brunswick is a banner of arms (an armorial banner?) modeled after the Coat of Arms of the province, but what an dive into the Wiki-Page of the flag reveals is how much the design was driven by the other big vexillological change at the time in Canada- namely the replacement of the Canadian Red Ensign with the maple leaf we all know and love. People liked the Red Ensign and there was a lot of nostalgia for it in Canada which lead to modified versions of it being adapted as provincial flags (Ontario, Manitoba) and the parliamentary opposition at the time had planned to table a motion to adopted the Red Ensign as well, but then Premier Louis Robichaud had a different idea. 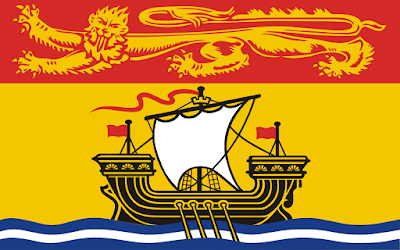 New Brunswick, you see, had been settled by both the French and the British over the years and despite the expulsion of the Acadians, many had returned and there was a sizable Acadian minority in the province. Wanting to avoid something 'too British' as it were, they went with the armorial banner and it's actually pretty cool. Here's the cool thing about the flag of Newfoundland and Labrador: you can hang it as a vertical banner and when you do that- the gold arrow becomes a sword, honoring the sacrifices of Newfoundlanders in military service- it joins with the red triangles to form a trident, which represents the province's dependence on it's fisheries and the resources of the sea. Finally, we've got just the flag of Labrador! 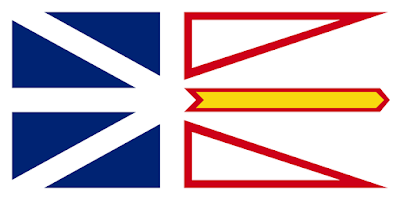 It's unofficial- but used to represent the mainland of Newfoundland and Labrador since 1973. 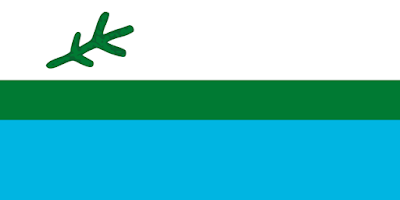 The symbolism is pretty basic: the white (surprise, surprise) stands for snow, the blue stands for the waters which serve 'as a highway and sustain of the people of Labrador'- the green bar is the nurturing land and it's smaller than the others because well, the summers are shorter. The twig is where it gets interesting. It's in two year growths: the inner twigs stand for the hardships at the past, while the outer ones are for the hope for the future. The three branches in between for the three nations of Labrador: the Innu, Inuit and the white settler. The branches coming from the single stalk represents the unity of the peoples. So, that's Canada Day! Remember, until next time, keep your flags flying- FREAK or otherwise!